MacKenzie Commercial Real Estate Services, LLC is pleased to announce their recent leasing assignment, the offices at 1111 Light Street, located in the heart of Baltimore’s Federal Hill neighborhood. MacKenzie’s Executive Vice President Chris Bennett and Real Estate Advisor Allison Perry will be working to find tenants for the remaining available space which ranges up to 8,000 square feet situated on the second floor of the building. 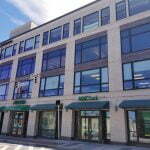 The building is owned by a local partnership lead by Washington Place Equities. 1111 Light truly embraces the live, work, play concept boasting class A office space, luxury residential units, and numerous amenities and services at one’s fingertips. The project is across from Baltimore’s iconic Cross Street Market which is currently undergoing massive renovations scheduled to be completed by year’s end. With plans for updated common areas, building signage, and lighting, 1111 Light also offers tenants access to an onsite parking garage, a location convenient to Baltimore’s Central Business District and I-95, and open layouts with high ceilings. “Having worked with the MacKenzie team in many capacities, we are confident that their services and local presence will aid in leasing the remaining space at 1111 Light and we look forward to welcoming new tenants,” stated Dominic Wiker of Washington Place Equities. For more information on leasing opportunities, please contact Chris Bennett at cbennett@mackenziecommercial.com or 410.953.0352, or Allison Perry at aperry@mackenziecommercial.com or 443.573.3208.